Conference in DC this week. I got to town in time to walk over to my favorite museums on the Mall, before working in my hotel room into the evening. I wanted, in particular, to visit the Robert Motherwell painting in the modern building. This has been a favorite of mine since I first saw it. I can't decide why. I think it has to do with motion, repetition, and the ratios. It also seems to be escaping its frame, or the internal frame painted lightly around the 10 foot by 30 foot canvas. And the Calder gallery, with the mobiles and stabiles and their changing shadows on the walls. This room would have pleased him, I think. It's a playful space, and the mobiles are in constant graceful motion. Today I noticed how much they owe to the split and arrangements of branches and leaves on certain species of trees. I am almost certain that's what inspired some of these. I also had to visit the Matisse paper cutouts. Last time we were in this museum, a little over a year ago, I think, the cutouts were up in the tower by themselves, which gave a reverent, chapel sort of feeling to the exhibit. Now they are in a small gallery downstairs - still by themselves in the space, but not as set apart. I love them - this is the only one I photographed - the larger ones won't be captured. As I was leaving the modern building, to head for the more traditional building next door, I saw one more little exhibition, of "Small French Paintings." I am so glad I took the time to go in there. 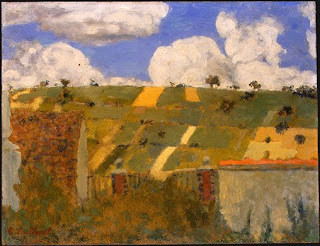 They had a small room dedicated to small paintings by Vuillard, Bonnard, and one Odilon Redon. I could have eaten the tiny Redon canvas with a spoon like my favorite flavor of icecream, it was so delicious. But my favorite in the entire building was the small Vuillard scene of fields in Brittany. If I could have any object in Washington DC, I might choose this little canvas, probably not more than 10 by 12 inches. The little works in that room inspired me all over again to paint. And I stood for quite a while in front of Whistler's Symphony in White #1. This is probably my favorite of his paintings. The sad thing is that it probably contributed in a major way to his death. The painting is worked all over with the lovely, fat, creamy white he loved best - Flake white - a strong lead pigment. Jimmy Whistler worked with several brushes at once, and, as he switched rapidly between them, he held the extras in his teeth. He died of lead poisoning. Close by the Symphony, is a portrait of Vanderbilt - the first fortune maker, I think - the grandfather of the Vanderbilt who created Biltmore House in NC. It was a warm day, but not as brutal as July should be in Washington. The walk was long, possibly five miles round trip, but I enjoyed it, and the hot dog with sour kraut I bought from a pushcart on the way. The cityscape, the people on the sidewalks, the light, the shops and restaurants - DC has so much variety. The smells on the streets were also a constant whirl of change, pleasant and unpleasant. I worked hard today, absorbing an 84 page standards document for tomorrow's session, plus the long drive up here and several hours of answering e-mail. But it was lovely to have a brief chance to get out into this American city, hear snatches of conversation all around me, many in languages I did not recognize, and watch the world rolling by as I strolled through it on my way to absorb some art. this was a fun post as I have never been there and so enjoyed seeing a teeny bit of it....I can only imagine what I am missing! yes, SF.,...so close and yet very far these days...there are so many wonderful galleries and museums in SF, I am rather spoiled to have it so close by...a lovely city..
Ah. Another reason to want to go back to D.C. for a long visit.